Inventive Fishing strives to provide new ways of thinking about and practicing fishing that are unavailable in other venues. To be inventive is to think toward the next fish, to think toward the new. Inventive Fishing espouses innovation but respects tradition and history, providing readers with new ways to think about fishing while still acknowledging each angler’s individual rituals. An aggregate news site to bring you current news and information from across The Saltwater Nation. Media from across The Saltwater Nation to encourage the visual enjoyment of the Saltwater Fishing Life. In-depth video gear reviews of the latest tackle and gear available in the sport fishing industry. Dynamic articles, tips, and advice about saltwater fishing strategies, issues, and species. Links to fishing regulations worldwide. Regular giveaways to citizens of The Saltwater Nation. Opportunities to ask the Fishing Professors questions pertaining to the Saltwater Fishing Life. Quality apparel and gear that reflects the Saltwater Fishing Life. Inventive Fishing believes in the value of saltwater fishing, and believes that it should promote values that help keep saltwater fishing alive and thriving. Toward these values, Inventive Fishing operates from within an ambient value structure of ethics, responsibility, and sustainability, concerned with the individual’s rights and connections to his or her own fishing values and the collective voice of The Saltwater Nation’s love and concern for marine environments and inhabitants. Inventive Fishing endeavors to educate and inform so as to protect and preserve the saltwater public trust. Inventive Fishing supports all facets of the sportfishing industry, encouraging invention, innovation, and progress toward the goal of enhancing and preserving the many nuanced facets of the Saltwater Fishing Life. Inventive Fishing embraces The Saltwater Nation as a diverse global community with often divergent beliefs and values, but galvanized under the banners of excitement, adventure, passion, and ephemeral intoxication that only saltwater fishing can elicit. Sean Morey is an Assistant Professor of English in the University of Tennessee’s Department of English, where he teaches courses in writing, rhetoric, and environmental literature. He has previously served as the Assistant Web Editor for the Ichthyology Division of the Florida Museum of Natural History, where he designed and maintained their website, which includes the International Shark Attack File, the Sawfish Implementation Team, and the Florida Program for Shark Research. Originally hailing from Sugarloaf Key and growing up in the Florida Keys backcountry, Sean learned flats fishing from the guides at Sugarloaf Marina, built his first custom boat when he was 10 years old, and has been re-inventing fishing ever since. Sid Dobrin is Professor and Chair of the Department of English at the University of Florida, where he teaches graduate-level courses in writing, technology, and ecology. He is also the Director of the Trace Innovation Initiative at UF. 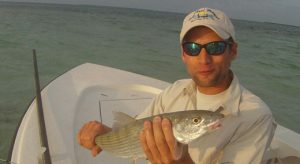 He serves on the Advocacy Committee for the American Sportfishing Association. He has published twenty books about writing, ecology, and technology, including Distance Casting: Words and Ways of the Saltwater Fishing Life. 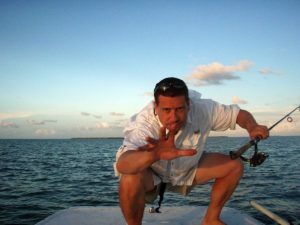 A former Field Editor with The Fisherman magazine, his writing about fishing has appeared in The Sport Fishing Report, The Yale Angler’s Journal, Saltwater Sportsman, Florida Sportsman, Yak Outlaws Magazine, and Extreme Kayak Fishing Magazine. His new book Gone. Fishing. will be published this year by Texas A&M University Press. An addicted saltwater angler for more than 40 years, a dive instructor and rescue diver, boat captain and guide, Dobrin is showing signs of growing gills.